Louisville Visual Art is now accepting nominations for the 2019 LVA Honors. Rising Star Award - The Rising Star Award is an annual recognition of an emerging artist in the Kentuckiana region. The artist receiving this distinction will be considered a new and or up and coming artist, however, age will not be a determining factor. The winner of the award will separate his or herself from the rest of the candidates by demonstrating a widely acknowledged expert skill set in their respective field. Commercial success will help in distinguishing candidates, however, it will not be the most determining factor. The Rising Star Award winning will be an individual who's future is bright both in terms of commercial success, but as well as impacting the local artist community. Achievement in Art Education Award - This award will be given to an individual in the Kentuckiana region who has had a longstanding and important impact on developing, teaching, and inspiring artists. This individual will be recognized for their dedication to enriching the lives of students of all ages by meaningfully and continuously educating people in the world of art. Benefactor of the Year Award - This award will be given to an individual (at least in the beginning, possibly later to an organization) that has gone above and beyond in giving back to the local artist community. Whether it be through funding education initiatives, sponsoring events, or through personal/familial/estate gifts, this individual has left a lasting impact on the arts community over the past year. Legacy Award - The Legacy Award will be given to an individual that has positively impacted and improved the arts community in many different ways for a time period spanning decades. This individual truly represents what it means leave the world a better place than you found it and their positive impact will be felt, seen, heard, and remembered for generations to come. Thank you! Your engagement with Louisville Visual Art is essential and much appreciated. 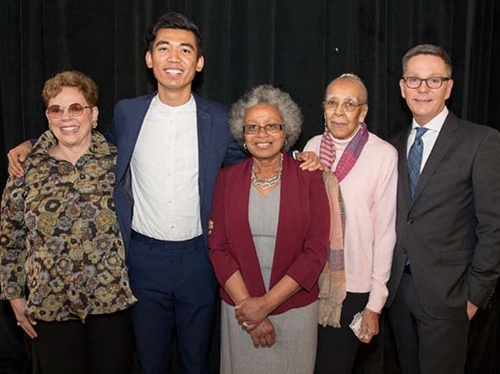 The 2018 LVA Honors honorees: Porter Watkins (Benefactor), Vinhay Keo (Rising Star), Wilma Bethel (Educator), and Elmer Lucille Allen (Legacy) standing with Louisville Visual Art Executive Director, Lindy Casebier.